NEW YORK, USA -- The success of the peacekeeping mission in Côte d'Ivoire could not have been possible without Ukrainian peacekeepers, believes the UN Secretary-General Ban Ki-moon. This statement was released during the International Defense Dialogue in Jakarta, Indonesia. "...We might not have prevailed without the contribution of one country: Ukraine, which lent us three combat military helicopters at the critical moment," said Ban Ki-moon in his speech to the government officials and the international security experts who attended the conference. The UN leader mentioned that democratic transformations in Côte d'Ivoire started back in 2010 when the independent elections committee announced the opposition leader Alassane Quattara as a winner. Having lost in the elections that were considered transparent and democratic the then President Laurent Gbagbo, nevertheless, refused to accept his defeat. He was reported to exploit ethnic tensions, organize attacks against the UN patrols and order weapons use against his own people. 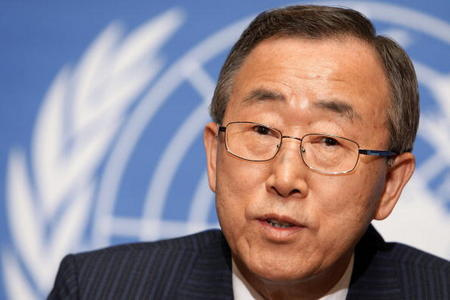 Ban Ki-moon recognized that through the joint efforts of Ukrainian helicopter squadron and the French forces deployed in Cote d'Ivoire as part of an operation Licorne it had become possible to neutralize the use of heavy weaponry which were attacking the United Nations peacekeepers and killing civilians. 38 Ukrainian peacekeepers from the 56th separate helicopter squadron of Ukrainian Armed Forces, serving as part of the United Nations Organization's mission in Liberia, participated in operation to maintain security during the runoff presidential elections in Cote d'Ivoire in December 2011, reported Ukrainian News. Back on January 19, 2011 the UN Security Council adopted the Resolution 1967 to strengthen its peacekeeping mission in Côte d'Ivoire. At that time Ukraine received both an official note from the UN Secretariat soliciting assistance and personal request from the UN Secretary-General Ban Ki-moon to support the UN peacekeeping force in the region. Ukraine has been recognized for its important contribution in supporting global peace and security through participation in peacekeeping initiatives. Thus far, Ukraine took part in more than 20 peacekeeping operations in 12 countries under the auspices of the UN.